Choosing a venue for your event can be quite the quest. What is it that would give your event just the charm you’re looking for? The questions you ask yourself can seem endless. I’m here to help you sort out one of, perhaps, many. Indoor or outdoor? The difference between indoor and outdoor venues that immediately comes to mind is space. Having an indoor venue limits you to a set space. You can’t spread out past the walls of a building. 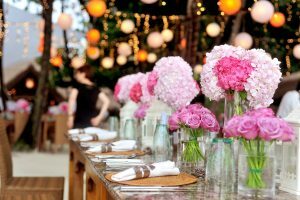 An outdoor event lets guests spread out as desired. If your tent is open, it allows guests to choose whether they’d like to be under cover or under the sky without feeling like the party is split. Giving your guests the option to breathe in the fresh air without actually leaving the party will make the whole experience more enjoyable. The one thing an indoor venue has over an outdoor one is defense against the weather. If it’s hot or cold out, a building can regulate the temperature so that guests are comfortable. No one wants to feel overheated or chilly when they’re trying to be sociable. Fortunately, tents can do the same thing! You get the benefit of spaciousness and temperature control all in one. You can rent heaters or air conditioners with your tent so that everyone is comfortable no matter the weather. Varsity Tents offers everything you need to have a comfortable event. Seating at an indoor venue can vary greatly, but most commonly, you see tables and chairs. Outdoor venues have more room to set up lounging areas and you can even use multiple tents to allow for separate lounging spaces. Indoor tables tend to become a collection place for peoples’ belongings and often feel exclusive, discouraging using the tables for socializing and in turn, leaving them to waste space. Outdoor events with lounge areas tend to make socializing easier, especially if seating isn’t reserved and people don’t feel anchored to one spot. Booking an indoor venue can be, not only costly, but difficult when you’re looking for a specific time frame. You might have to wait weeks or months for the location you want to become free when you need it. Tents have the benefit of being much more flexible when it comes to scheduling. You can rent them much easier than indoor venue spaces. Not only are they easier to rent, you can also have them set up in a number of locations. You aren’t tied down to one location like you would be with an indoor venue. Designing your event around a tent allows you lots of room for picking the event location. While indoor and outdoor venues each have their strong points, tents manage to take the best of both and bring them together!